The Negroid characteristics of the Queen's portraits certainly had political significance since artists of that period were expected to play down, soften or even obliterate undesirable features in a subjects's face. Sir Allan Ramsay was the artist responsible for the majority of the paintings of the Queen and his representations of her were the most decidedly African of all her portraits. Ramsey was an anti-slavery intellectual of his day. He also married the niece of Lord Mansfield, the English judge whose 1772 decision was the first in a series of rulings that finally ended slavery in the British Empire. It should be noted too that by the time Sir Ramsay was commissioned to do his first portrait of the Queen, he was already , by marriage, uncle to Dido Elizabeth Lindsay, the black grand niece of Lord Mansfield. Thus, from just a cursory look at the social awareness and political activism at that level of English society, it would be surprising if the Queen's negroid physiogomy was of no significance to the Abolitionist movement. 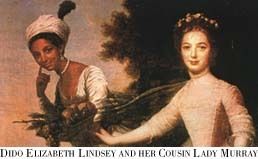 Lord Mansfield's black grand niece, for example, Ms. Lindsay, was the subject of at least two formal full sized portraits. Obviously prompted by or meant to appeal to abolitionist sympathies, they depicted the celebrated friendship between herself and her white cousin, Elizabeth Murray, another member of the Mansfield family. One of the artists was none other than Zoffany, the court painter to the royal family, for whom the Queen had sat on a number of occasions. It is perhaps because of this fairly obvious case of propagandistic portraiture that makes one suspect that Queen Charlotte's coronation picture, copies of which were sent out to the colonies, signified a specific stance on slavery held, at least, by that circle of the English intelligencia to which Allan Ramsay, the painter belonged. Was this Britain's first black queen? For the initial work into Queen Charlotte's genealogy, a debt of gratitude is owed the History Department of McGill University. It was the director of the Burney Project (Fanny Burney, the prolific 19th century British diarist, had been secretary to the Queen), Dr. Joyce Hemlow, who obtained from Olwen Hedly, the most recent biographer of the Queen Charlotte (1975), at least half a dozen quotes by her contemporaries regarding her negroid features. Because of its "scientific" source, the most valuable of Dr. Hedley's references would, probably, be the one published in the autobiography of the Queen's personal physician, Baron Stockmar, where he described her as having "...a true mulatto face." Finally, it should be noted that the Royal Household itself, at the time of Queen Elizabeth II's coronation, referred to both her Asian and African bloodlines in an apologia it published defending her position as head of the Commonwealth. In the Flemish masterpieces depicting the Adoration of the Magi, the imagery of the black de Sousas had been utilized as both religious and political propaganda to support Portugal's expansion into Africa. In addition, the Flemish artists had drawn from a vocabulary of blackness which, probably due to the Reformation and the Enlightenment, has long since been forgotten. There was a wealth of positive symbolism that had been attributed to the black African figure during the Middle Ages. Incredible as it would seem to us today, such images had been used to represent not only Our Lady - evidence of which can be found in the cult of the Black Madonna that once proliferated in Europe - but in heraldic traditions, the Saviour and God the Father, Himself. Researched and Written by Mario de Valdes y Cocom, an historian of the African diaspora.